Artisphere celebrated its opening day on 10-10-10 with free dance, music and theater performances. This new venue located two blocks from the Rosslyn Metro plans to transform the DC art community by providing an innovative space for a variety of art forms including comedy, performance art and poetry. Urban Artistry, Bowen McCauley Dance, Hoop Dance DC and Jane Franklin Dance were among the groups who performed at the Artisphere opening. Bowen McCauley Dance performed on the main staircase of the Town Square area at 4pm. The dancers took advantage of the staircase landing for their main performance space and used the railings like ballet barres. The white wall behind the dancers served as a huge projection screen which played a corresponding video. The majority of dancers were dressed in white with one male dancer dressed in black. I couldn’t guess the story line based on the choreography, but the video hinted at a heaven/hell theme with the dancers donning angel wings. At 4:30pm, I headed to the Ballroom area of Artisphere to check out members of the Meetup group Hoop Dance DC. Jocelyn Gordon, the group’s organizer, introduced the concept of hoop dancing which incorporates dance moves with the exercise fad of hula hooping. I found out from her opening remarks that hoopers have hooping names like bboys. Her name was ‘Star Cobra’ and another hooper went by ‘Baby Daddy.’ There was more hoop than dance in the hoop dance performance, but the spectators – especially the kids – were loving it. I also listened to a unique musical performance by Sonic Circuits in the Dome and explored the ‘Skateboard Side Effects’ exhibition in the Terrace Gallery. 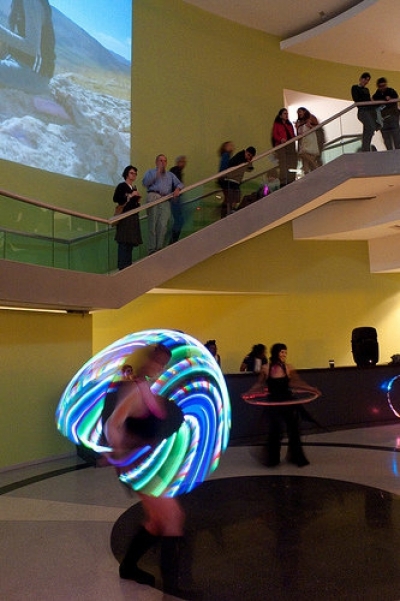 What did you experience at the Artisphere opening? What did you think about the space? Cecile Oreste is an arts marketing and public relations professional living in Los Angeles. Follow her on Twitter @cecileoreste.